A few weeks ago I participated in the Global Big Day. This was a special birding day held all over the world. Participants went out birding in their local patch. This could be your own garden, a nearby park, or a little further away. I decided to visit six of my favourite local birding sites, starting with my own garden. It was an interesting and relaxing afternoon. I visited several spots I had not been to in quite a while. Naturally, my camera came with me. 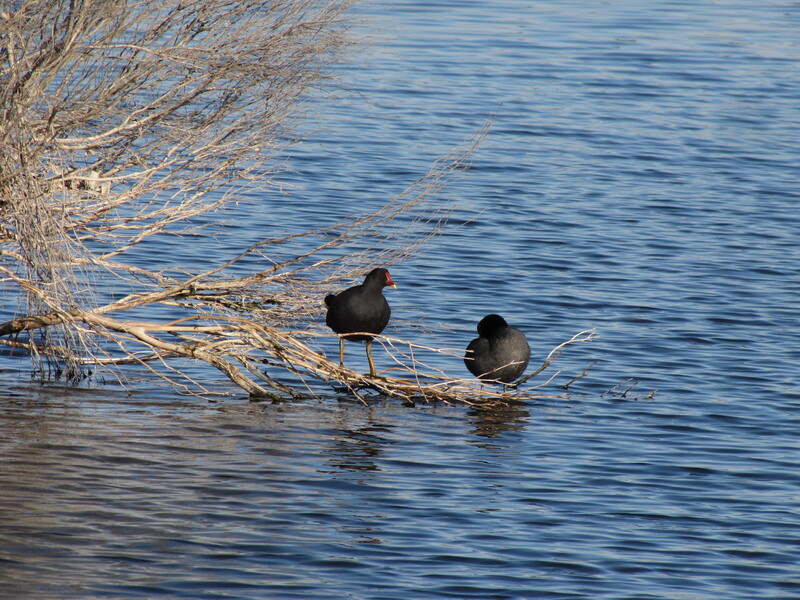 One of my birding sites was Sturt Reserve here in Murray Bridge, South Australia. This reserve, about five kilometres from my home, incorporates large grassed picnic areas along the River Murray. 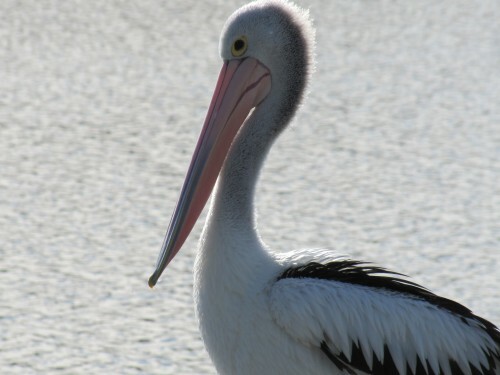 At this point, the river is quite wide and affords good views of quite a range of water birds, including ducks, coots, swamphens, cormorants, darters, pelicans and grebes. The picnic areas have some old growth gum trees which are favoured spots for a range of parrots, cockatoos, honeyeaters and magpies. To the south of the reserve, there are several shallow lagoons. These generally fill up due to run-off from land nearby during rain. They would also be filled if the river ever flooded. There may even be a way for water to enter these lagoons directly from the river, but I am not aware if this actually happens. 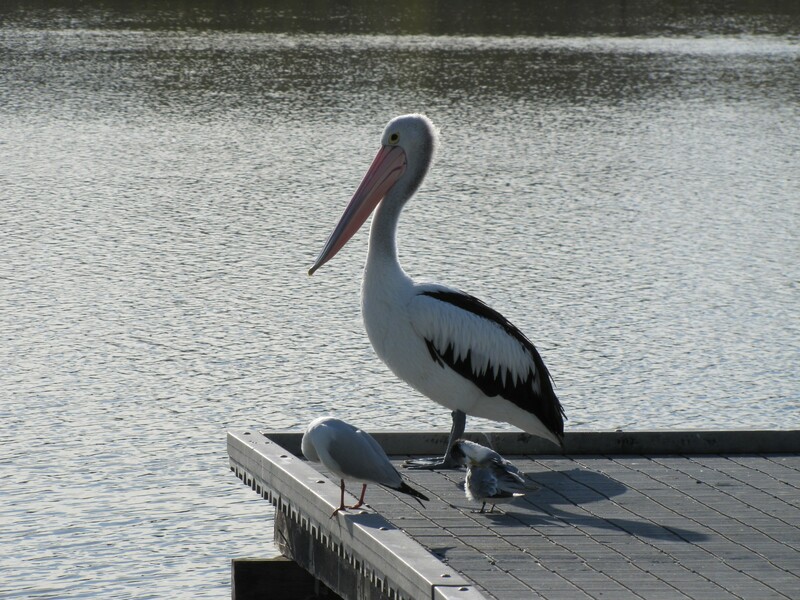 These lagoons also attract a range of water birds. 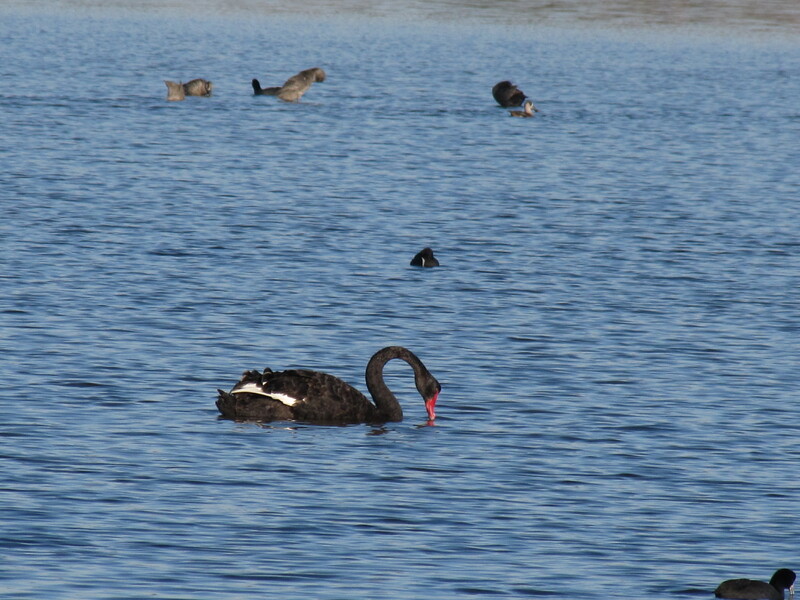 On my special day out birding, I saw Black Swans (see photo above). Please note that if you click on any of the above list of birds, it will take you to more articles and photos of those species. From time to time I take out a few minutes from my day to go birding. Sometimes these few minutes stretch into a few hours. I recently took off a whole afternoon. During this time, I visited six birding spots around my home town of Murray Bridge which is about an hour’s drive south-east from Adelaide. 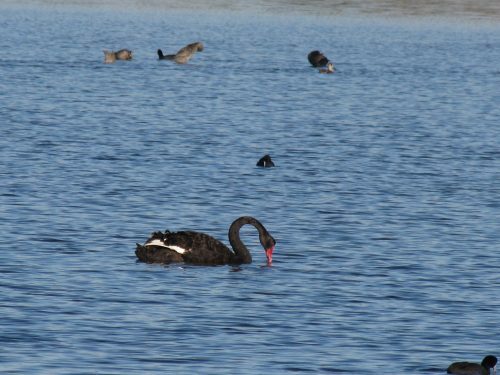 One of the spots I visited was Sturt Reserve. This lovely spot is on the banks of the Murray River. It is named after Captain Charles Sturt who explored the river in 1830. The reserve has large areas of lawn for picnics, a large playground and a restaurant. It also plays host to a wide variety of birds. 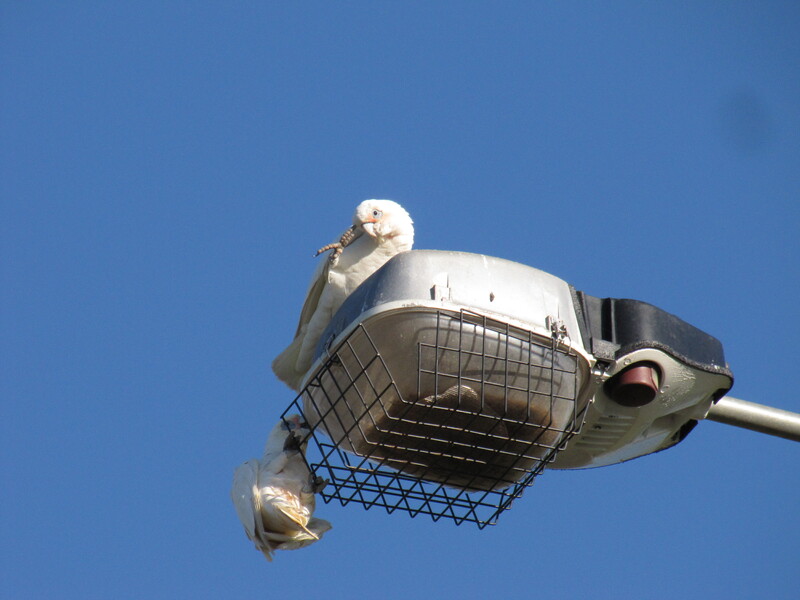 On my recent visit, there were quite a few Little Corellas in the trees along the river. 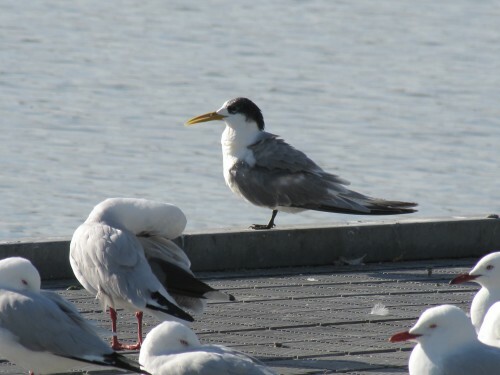 In flocks of 30 – 50 they can be annoyingly noisy. In recent years, these flocks have grown into the hundreds on many occasions. 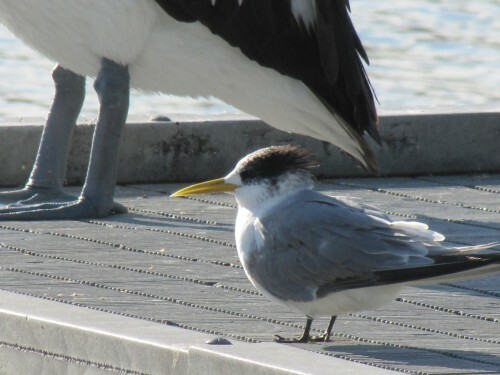 They are known to be high on the list of the Villains of the Bird World. In large flocks like one can see at Sturt Reserve – and other spots around the district – they can wreak havoc on trees, stripping leaves, twigs and bark from trees until little is left but for a carpet of gum leaves on the ground below. 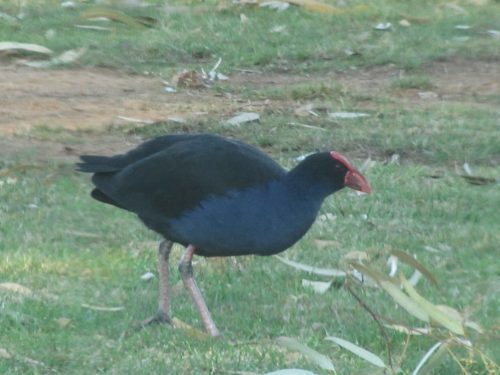 The nearby lawn-tennis courts have also been a target of these destructive birds. 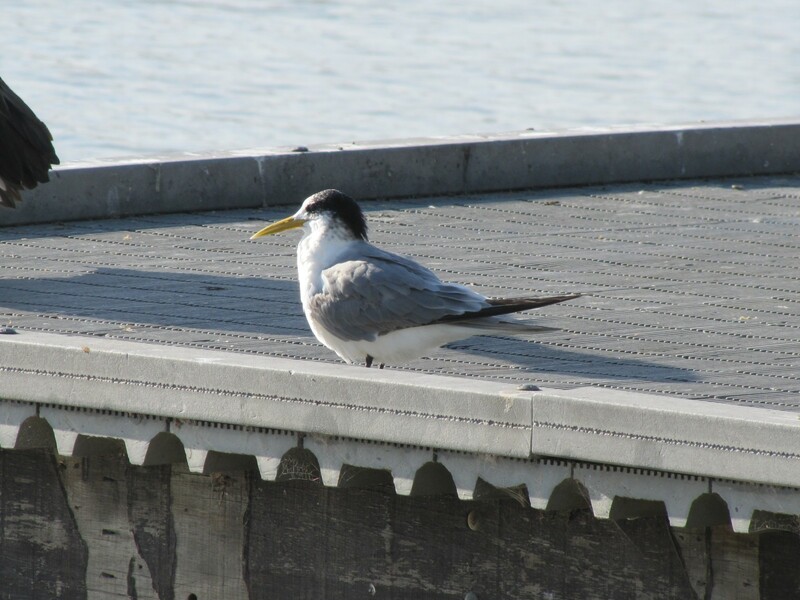 They have sometimes left the courts unusable after the sharp beaks of several hundred birds have visited. 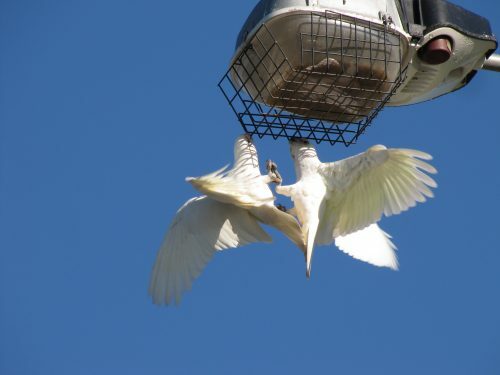 Various methods to disperse the flocks have been tried, but without much success. This is a widespread problem in many places in South Australia. 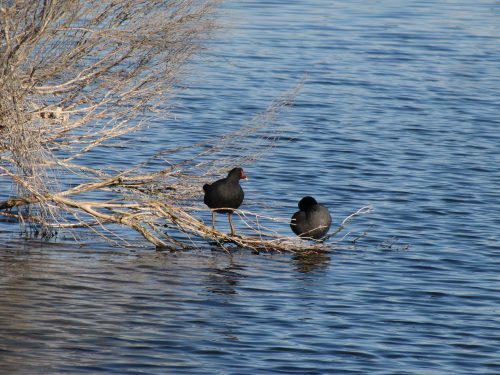 Later, I drove a few kilometres to the southern edge of town to visit Swanport Reserve, also on the banks of the river. 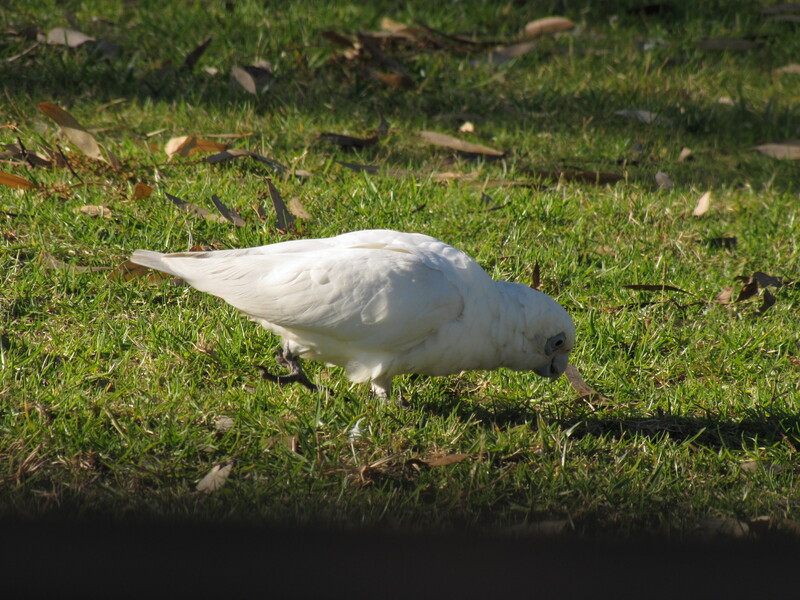 Here I witnessed flocks of several hundred corellas flying along the river and then out onto recently cultivated farmland across the river. Because of the distance, I was only able to estimate their numbers. After many smaller flocks had joined into one large flock, there must have been at least 1200 birds – possibly as many as 2000. The photos below were taken at Sturt Reserve. They show the playfulness of some of the birds on the street lights. 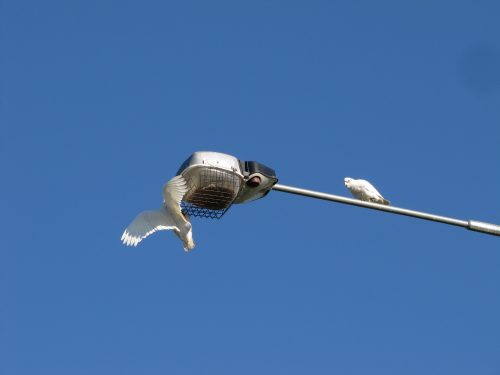 While I couldn’t see any damage to the lights from their beaks, they are quite capable of causing the local council some expensive headaches. 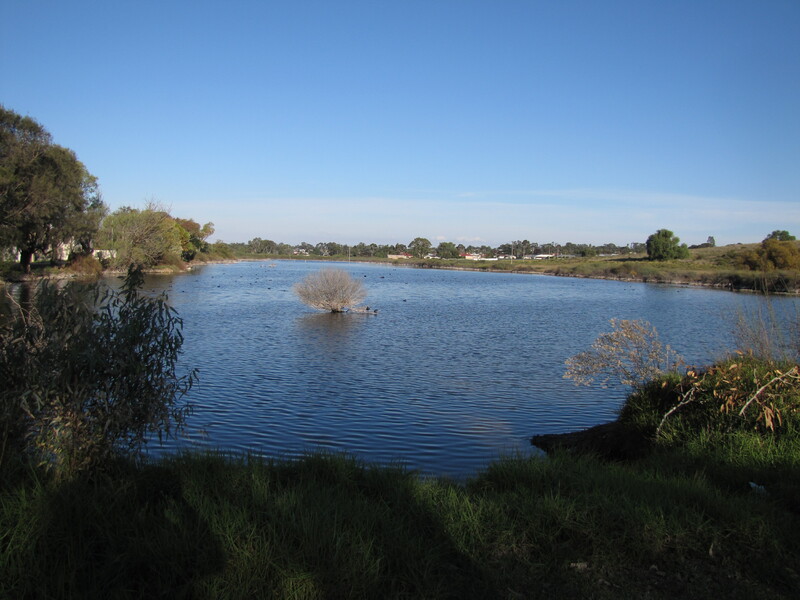 A few days ago I took some time out of my busy schedule and drove down to Sturt Reserve near the centre of town. I had a reason to take my camera with on this occasion which was just as well because I saw and photographed quite an interesting range of our local birds. 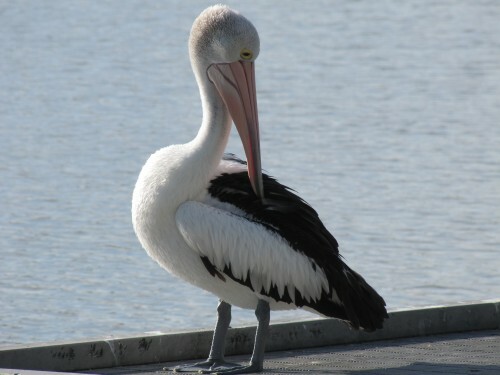 This Australian Pelican posed or me on the end of a small jetty near the reserve. With the mid-morning sun coming from behind it gives an interesting effect. A few weeks ago went had a family get together. Our son and family were over here for our grandson’s 3rd birthday, and my wife’s sister and niece and her family came down from the mid north of the state. we had a barbecue lunch at home and in the afternoon we went to Sturt Reserve so the children could play on the excellent playground there. This reserve is popular with locals and visitors. 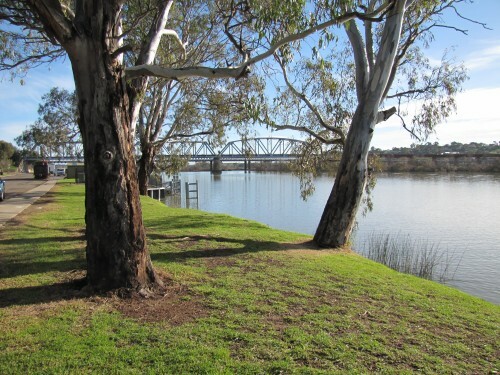 It has plenty of lawn areas for picnics along the banks of the Murray River. After the children had played for a while we all went for a short stroll along the river bank. I had my camera ready – but more for people shots. I wasn’t really taking all that much notice of the birds. I still managed a few good shots as shown here. 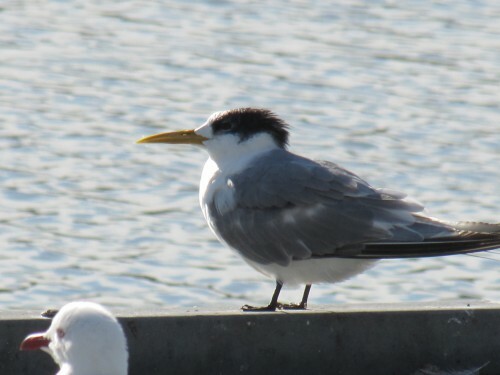 The Whiskered Terns (see photo below) was a challenged as they constantly flew over the water. I must practise more at photographing birds in flight.